1 Peter 5 [1.] I exhort the elders among you, as a fellow elder, and a witness of the sufferings of Christ, and who will also share in the glory that will be revealed. Shepherd the flock of God which is among you, exercising the oversight, not under compulsion, but voluntarily, not for dishonest gain, but willingly; neither as lording it over those entrusted to you, but making yourselves examples to the flock. When the chief Shepherd is revealed, you will receive the crown of glory that doesn’t fade away. 1 Peter 5 [5.] Likewise, you younger ones, be subject to the elder. Yes, all of you clothe yourselves with humility, to subject yourselves to one another; for “God resists the proud, but gives grace to the humble.”[a] Humble yourselves therefore under the mighty hand of God, that he may exalt you in due time; casting all your worries on him, because he cares for you. 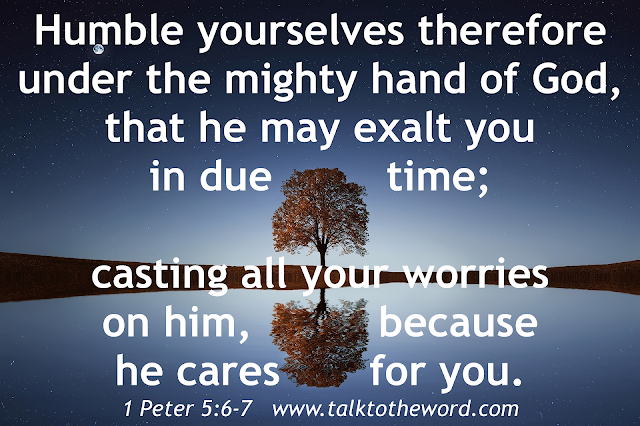 1 Peter 5 [8.] Be sober and self-controlled. Be watchful. Your adversary, the devil, walks around like a roaring lion, seeking whom he may devour. Withstand him steadfast in your faith, knowing that your brothers who are in the world are undergoing the same sufferings. But may the God of all grace, who called you to his eternal glory by Christ Jesus, after you have suffered a little while, perfect, establish, strengthen, and settle you. To him be the glory and the power forever and ever. Amen. a. 1 Peter 5:5 Proverbs 3:34.